Michael will once again be a featured artist at the Rockin' for Rett benefit concert. Rockin' for Rett 2.0 will be held October 2 at Tucker's Farm in Gabriels, NY. This year's event will feature a number of performers, as well as great food and Tucker's famous corn maze. This year's corn maze will feature a Rockin' for Rett theme. Visit Rockin' for Rett in Honor of Emma for more information. A trip to the Gulf to help out with the oil spill (gulfcoastpost.org) has delayed my getting into the studio to record Summer Fading. I have been going over some of my older songs and reconsidering what I may include in the upcoming CD. My plan is to reassemble my small personal digital studio and put together this CD myself in time for Meadowlark and Rockin' for Rett. We shall see. . . . Here is an update on my upcoming CD entitled "Summer fading . 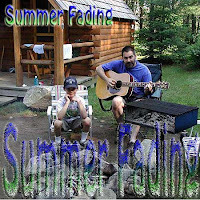 . . "
I have burned rough drafts of the songs to CD and sent them on to Dan Duggan at Esperance Productions in Red Creek, NY. Dan has agreed to be my recording engineer and production assistant at his recording studio. Here is the list of original songs as it stands now, arranged somewhat seasonally. I am also considering a few additions or alternates.